Michael Faraday was born on September 22, 1791. Because he wasn’t from a very rich family, he received a very basic education. When he was 13, he became an apprentice for seven years to a bookseller. His job was to deliver newspapers and bind books. While under apprenticeship, he read books on science during his spare time. Two of his favorite books he read included Isaac Watts’ book, The Improvement of the Mind and Jane Marcet’s book, Conversations on Chemistry. He developed a great interest in electricity, especially after reading an article on electricity in Encyclopedia Britannica. During that time, he even kept a record of what he read and what experiments he performed. After his apprenticeship, he got tickets to attend four lectures given by Humphry Davy and John Tatum at the Royal Institution. Later on, after much begging, Davy took Faraday as his temporary secretary. He even acted as a servant to Davy when he went on a tour for two years (from 1813-1815). 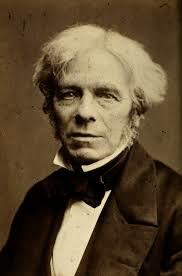 Michael Faraday made a lot of contributions in the field of chemistry and electricity. While working as Davy’s assistant, he invented an early form of the Bunsen burner (source of heat.). Although he wasn’t the first to invent it, he modified it. He made a lot of other contributions to chemistry, like liquefying chlorine (gas) for the first time. In the field of electricity, his greatest contribution was the first invention of an electric motor in 1821. The electric motor creates mechanical energy from electrical energy. This invention was the building block of electromagnetic technology. He invented rubber balloons in 1824. In 1831, he invented the homopolar generator. That’s an early DC generator. In 1836, he invented the Faraday Cage. The exterior of the cage keeps electromagnetic radiation away from the interior because the cage’s exterior conducts electricity from outside and distributes it outside the cage. He later went on to prove that glass and light both have magnetic properties. In 1845, after years of studying, he placed a dense piece of glass on the poles of the electromagnet and then passed polarized light (light that travels in a single plane rather than in all directions) through the glass. After he turned on the current, the polarized light’s state changed. Michael Faraday never gave up. He always tried to build on scientific concepts, which he turned into realities. He received honorary doctorates from Oxford and Cambridge. Although he had been elected to a member of many science societies, he was nominated the president of the Royal Institution. Since he was meek, he rejected the honor of being the president three times. His picture was even printed on a 20 Pound note, named the Faraday Institute after himself, and the Royal Society had a plague named after him. On August 25, 1867, he died at his home. In conclusion, Michael Faraday’s childhood, how he overcame his circumstances, some of his inventions, and the honors he received were discussed. Since he loved science and worked hard, he became known as one of the greatest scientists in history. Michael Faraday’s life should motivate you to work hard and keep on trying even after you fail. After all, who knows what is possible, when you put your heart into it.